Anyone else hear about heirloom upgrades? Discussion in 'Level 110-119' started by Warglave, Feb 4, 2019. Apparently will go to 120 now... any impact tho?? Not great, but not bad for leveling. None will be BiS, though. Yep, basically selling more wow tokens. The armor upgrade is "only" 15k gold. I don't see any reason to do the weapons now, just the bonus XP slots. but the enchant must be able to enchant the item of that expac isnt it ? say a player didnt buy bfa, no legoin, no wod, he only has MOP .. if his item ilvl is increased, and his enchant ability does not match his item, meaning he cant enchant his items, that would be so weird .. right ? MOP SoO currently at 130 (132 warforge) i think .. gives it another 7 ilvl increase, it would go past the 136 mark, i dont know if i should be using the MOP or WOD as example .. we are all thinking from the BFA point of view at the moment, if i remember correctly an enchanter's ability at MOP is enchant up to 136 ? Keeping my eyes on these. 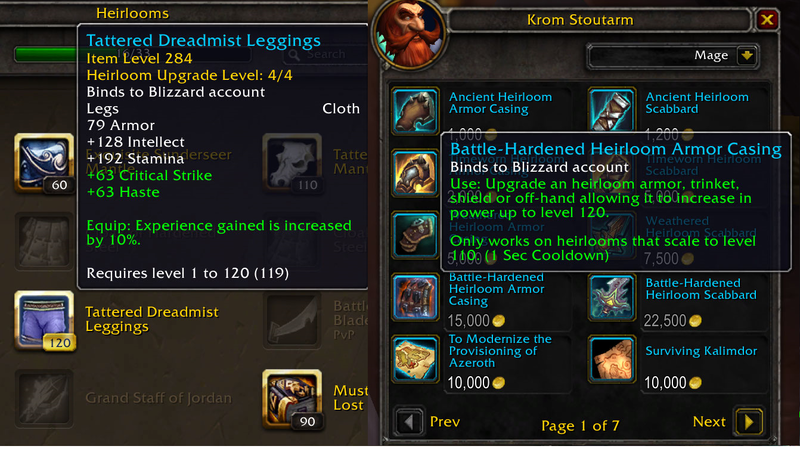 The single-secondary heirlooms could be great starter pieces (maybe even near-BiS) for 111+ movement speed sets. Good point, not sure what the IL increase is for then. And that’s on top of what you have already spent to get it to 110. Wowhead's PTR page is showing heirloom upgrades for some of the heirlooms, but not all. Assuming nothing changes from now until release, 110 heirloom item levels are increasing from 160 to 170. A current two-handed weapon with a single secondary stat at level 110 gives 54 of a secondary stat at 160. PTR 110 heirloom 2H weapons will have a secondary stat value of 58. Level 111 weapon ilvl will be 216. A 2H weapon with a single secondary stat value will give 79 of that stat. Hellscream's Decapitator gives 34 Crit, 38 Haste, and 2 sockets. My current crit+speed weapon gives me 3.8 movement speed at 110 passive, so the 10 ilvls aren't enough. Windwalk+Heirloom vs Stat+Speed+Navigation enchant is still relatively close depending on how much you value the Windwalk enchant. At 111, Hellscream's Decapitator might just be second BIS behind Rivendare, barring some perfect speed+socket+warforged Taeshalach/Scythe of the Unmaker. I'm excited for this patch!